Weekend Dance Workshop with Catrine Ljunggren – Aug 11, & 12, 2018 – Swing or Nothing! 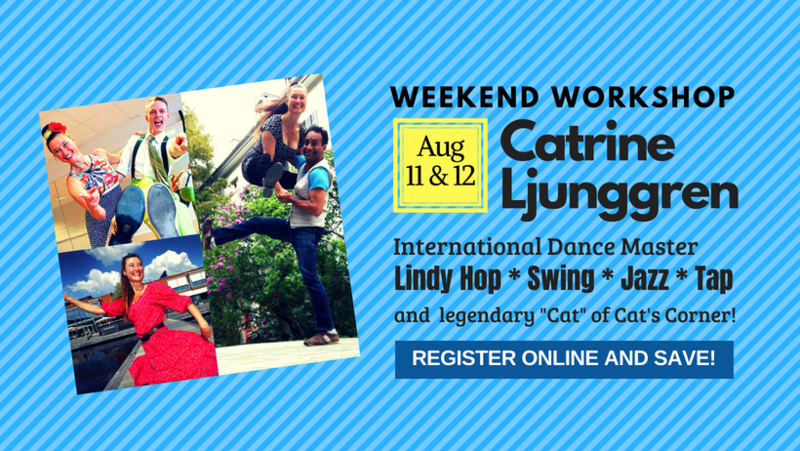 Learn Lindy Hop from Catrine Ljunggren, a one-of-a-kind swing dance master and important link to the historical roots of the dance. As early as 1985, Catrine helped spread Lindy Hop across the globe, performing with the Rhythm Hot Shots, the world renowned dance group. She helped organize, develop and has been a long-time teacher at Herräng Dance Camp – the world’s largest and longest running international swing dance camp. Swing legend Frankie Manning was her main teacher and mentor and she frequently taught with him at international events. Today, Catrine continues to share Frankie’s legacy and inspire new generations of swing dancers. Locally, Catrine is the founder and legendary “Cat” of Cat’s Corner. She brought Nathan on board in 2006, when the party moved to Savanna Jazz Club, and they developed a fun partnership and lasting friendship. 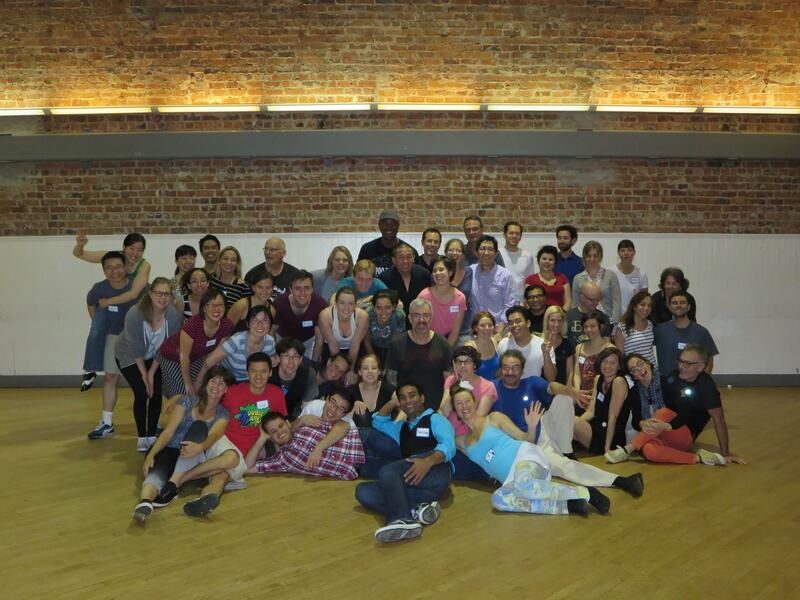 Recently, Catrine and Nathan taught weekend workshops in Sweden and Switzerland. They are excited to bring the same fun material and energy to students in their original stomping grounds in San Francisco! Classes are geared toward Intermediate and Advanced dancers. You must be able to dance the swingout, lindy circle, a variety of 6- and 8-count turns, and basic Charleston patterns, and are a regular social dancer. 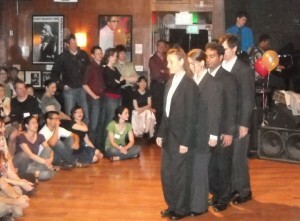 Tap dance taster welcomes students of all levels. Beginner/Intermediate students with at least 2 months of Beginning Lindy Hop classes may drop-in for the Saturday Fundamentals class. Super discount: $90 for first 3 leaders and 3 followers to sign up for the full workshop! Full Workshop: $100 early reg by Aug 9. $130 full price. Saturday Only: $60 early reg by Aug 9. $70 full price. Sunday Only: $50 early reg by Aug 9.$60 full price. Single class drop-in (with teacher permission): $30 per 2 hour class. $10 for Saturday evening Tap taster. Register now and save $30! 15 couples max. Register early by August 9th to get the best price. Catrine has been a profesional dance performer and teacher since 1985. She has a rich tradition to share based on her personal experinces learning from two of the founding fathers of lindy hop, Al Mins and Frank Manning. As a founder and member of the dance group ”The Rhythm Hot Shots” 1985 – 2002 (today The Harlem Hot Shots) she was part of the Lindy Hop revival. For 17 years she traveled together with the group around the world teaching and performing the Lindy Hop and other dances from that era like the Charleston, Authentic Jazz and Tap. She was a previous owner and organizer of Herrang dance camp from 89 – 02 and also the organizer of “Hop the Millenium” in Mexico 1999-2000. During her last 10 years she has been teaching at international workshops together with dance partner Elliott Donnelley. While living in San Francisco she started Cat’s Corner Swing Club where she taught regular classes. The club is still going strong and offers weekly classes and dances featuring live bands. In spring 2010 she worked at the George Lucas movie ”Red Tails”. For two years she lived among palm trees, coconuts and warm beaches where she’s taught children to tap dance. She’s recently lived in Sweden, helping to keep Frankie Manning’s memory and legacy alive teaching with his son, Chazz Young, and is now based in New York City, where she teaches at Dance Manhattan studio. Award-winning dancer Nathan specializes in Lindy Hop, the high-energy swing dance from the 1930s and 40s, and has been teaching, performing and DJing since 2005. He started swing dancing in 1997 and lindy hopping in 2000. 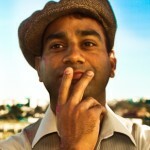 A regular dancer in San Francisco since 2001, Nathan enjoys the creativity and personal connection of social dancing as well as the challenge and satisfaction on working on and improving his dance. He has taught at practically all of the local swing dance venues at one time or another, including the 9:20 Special, Lindy in the Park, Tuesday Night Jump, Rent Party and original Doghouse, and has been a featured instructor at regional workshops such as Swingin’ at the Savoy, California Swingin’, *Workshop (San Luis Obispo), Santa Swing (Santa Barbara), and Le Hot Sauce (SF).